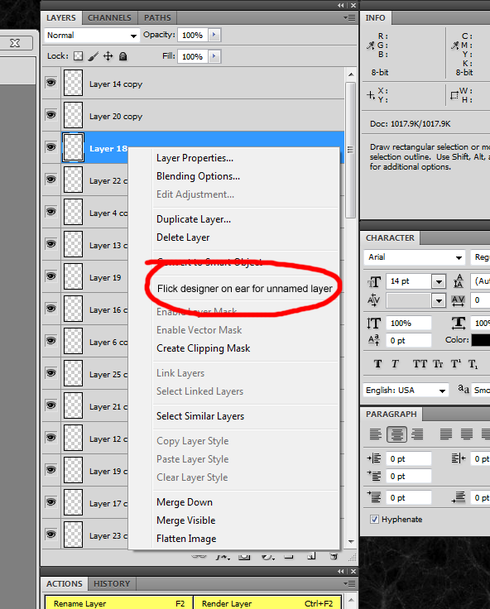 Feature request: For any unnamed layer offer a selection on the context menu to "flick designer's ear." Some designer's are in the habit of using the default "Layer ###" or "Group ###". That drives us developers crazy. We need a way to provide prompt and unforgettable feedback. I think flicking them on the ear - hard - sends the appropriate message. While an interesting idea, I doubt that our UI designers would agree to it (partly because they never name layers and have very delicate ears).